Jago will travel from the highlands of Ecuador to the shores of Lake Titicaca; from the Pacific Coast to the peaks of the Andes. Along the way he will build a picture of how this remarkable empire functioned. How did the Inca master their landscape to produce food for millions? How did they build such an astonishing network of roads connecting the cities of the empire? How did their encounter with the Spanish result in disaster? The Inca: Masters of the Clouds presents a rich, comprehensive and engaging history of one of the world's most incredible and beautiful civilisations. The Inca built the largest pre-Columbian empire in the Americas. Dr Jago Cooper explores how they did it, uncovering how Incan agricultural technology transformed the landscape, allowing them to cultivate a huge variety of crops even at high altitudes. He will see how they built an intricate network of storage facilities which allowed them to ward off famine and mitigate the worst effects of their climate and landscape. See how the Inca relied not on force, but on subtle methods of persuasion and cooperation to build this massive empire. By the early sixteenth century the Inca had conquered the Andes and controlled a huge swathe of western South America. But within a year of arriving in Peru, a few hundred Spanish conquistadors had captured their capital, Cuzco. Dr Jago Cooper explores the reasons for the Inca's fall. He uncovers how a combination of imperial over-reach, a devastating civil war and a series of deadly European pandemics hastened the Spanish conquest. 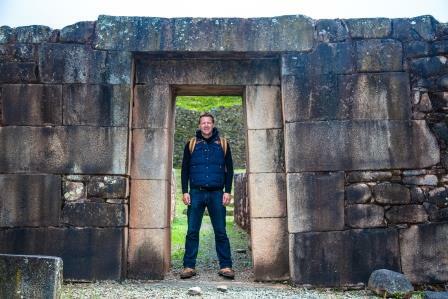 The Inca: Masters of the Clouds starts 7.35pm, Sunday 30 August on SBS.